Continuing my series on the Composable Enterprise I’m looking at how different thought-leaders and organizations perceive the shift from our current methods of doing business to the digital platforms that will drive future, more agile businesses. This week I cover the “The Digital Enterprise Shift”, a whitepaper written last year by Neil Ward-Dutton, co-founder and Research Director at MWD Advisors and a prominent member of the enterprise architecture community. Businesses find it increasingly difficult to compete in a hyperconnected world where ideas and expectations spread more quickly than they can react. Low-cost global competitors and digital disruptors are assailing established businesses from all sides. In such an environment the only remaining business differentiator is to provide a superior “customer experience”. 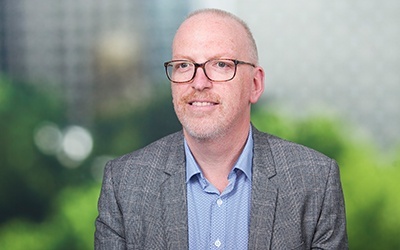 In this drive for superior, integrated customer experience, Neil says that IT can deliver strategic value by being able to co-ordinate work, gather insights and share knowledge at scale and across boundaries. In parallel to this business assault, Neil identifies four digital transformation vectors—cloud computing & SaaS, mobile computing, social software and big data analytics. These are all manifestations of the digital transformation of activities and they all deliver increased openness to the activities they transform. Cloud & SaaS: transforms technology access, procurement & ownership. Mobile computing: transforms location, people, things and connectivity. Social software: transforms interpersonal communications and access to knowledge. Big data analytics: transforms real-world events on a large scale. …a business in which digital technologies are strategically exploited to maximise global effectiveness, efficiency and responsiveness. “Digital technologies power the co-ordination of work, the creation and use of operational and management insights, and the sharing of knowledge—at scale, across boundaries, and in a highly integrated way”. Current enterprises make piecemeal use of digital technologies. By contrast, the Digital Enterprise takes a digital first approach to building, improving, linking and managing business capabilities. Digital, Integrated Management Systems: management systems are becoming more integrated, the boundaries between different management systems are blurring, and indeed the boundaries between management systems and operational systems are blurring and disappearing. Ultimately, management systems will coalesce into what Neil (and others) refer to as “Systems of Insight” (information), “Systems of Coordination” (process) and “Systems of Engagement” (people). These categories are described below and also more fully in Neil’s paper. Open and Collaborative: organizational structures are more fluid and transitory, individuals have greater access to information and are given greater authority to make decisions appropriate to the task at hand. Designed “outside-in”: services, processes and capabilities are design from a customer first perspective. Customer journeys and outcomes are the primary force driving processes, organizational structures, tools and information. Siloes, where they exist, are spanned by systems of coordination. Data-Literate: a “data” culture is created and nurtured which values information as a business resource and repects the way that information is managed. A respect for and sophistication with data is inherent throughout the enterprise from senior management down. Flexible & Adaptable (where necessary): digital technologies are assembled in a manner that advances business flexibility rather than retarding it. But there is a trade-off between flexibility/adaptability and efficiency/predictability which is understood and utilised in the right circumstances. Strategic: digital enterprises are not created by accident, but require deliberate, sustained investment and design that is linked to clear strategy. 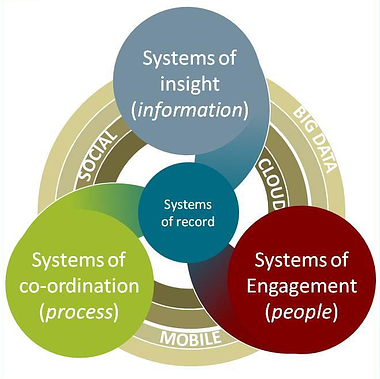 Integrated: the systems used by digital enterprises need to be aligned with and develop the three management system threads—systems of insight, systems of coordination and systems of engagement—integrated and mutually reinforcing. Incremental: the transformation to a digital enterprise is incremental and builds on previous investments. Cultural: digital transition will disrupt existing work practices and organization structures. New incentives will be required and organizational change management is essential. Collaborative: organizational buy-in is required. Collaborative, open, cross-functional teams will span the “IT-business divide”. Change will be a matter of course, rather than achieved through individual projects. Actionable: digital technologies cannot be applied in a vacuum. They need to be able to address real business pain points or opportunities and benefits need to be “sold” on the basis of improving the jobs that business teams perform. Systems of Engagement are responsible for any-to-any open sharing of information and knowledge, and collaboration between people and other business resources. Systems of Coordination are responsible for coordinating work across people and other business resources to support end-to-end delivery of business value. Systems of Insight are responsible for filtering, aggregating and analyzing data to derive insights for more effective business management or operational decisions. Systems of Record manage the raw information materials of the enterprise and we’ve seen these in our previous discussions on layered architectures. For systems of engagement, Neil points out that there are many collaboration platforms, both established and emergent to support these capabilities. Email, project management and workflow technologies are being joined by social platforms, marketing, CRM, mobile. I’ll note that web APIs are powering many of these capabilities. For systems of coordination, Business Process Management (BPM) has evolved beyond process automation to support more ad hoc task management capabilities and collaboration. Add to this Business Rules Management (BRMS) platforms, content management and operational analytics. A new area for coordination is represented by SaaS integration platforms and the availability of “workflow as a service”. Systems of insight have arguably had the biggest growth and attention in recent times. Big data, realtime analytics, decision support systems are all being integrated with engagement and coordination platforms to provide closed-loop digital management systems. I’ve recently talked about the benefits of analytics on this blog. I’ve only had time and space to provide a very high level summary of “The Digital Enterprise Shift”, please go and read it for yourself. But I hope you can get a general sense of his thesis which aligns with many of the other views in our Composable Enterprise series. Businesses have to take a strategic, transformation view to “becoming digital” in order to compete effectively in a global environment. The digital enterprise transformation relies on the strategic use of information technologies, on directed and incremental change and the utilization of integrated real-time systems to provide a superior customer experience. But there are also some interesting differences with other approaches we’ve looked at. I’ll be looking closer at complements and disparities between the different models in a later post.